We are always very happy to add new countries to our list and this time together with help from the Estonian Development Cooperation it's Armenia! 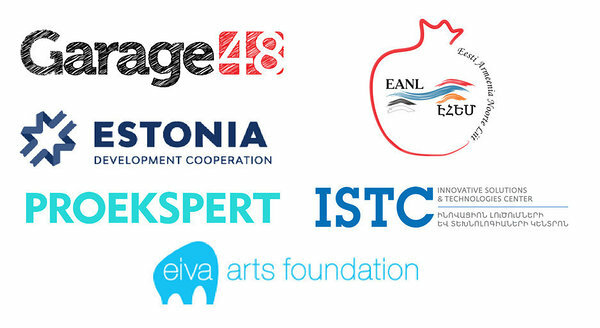 The hackathon bringing together arts, culture and technology is organised together with EIVA Arts Foundation and takes place at the wonderful ISTC Innovative Solutions & Technologies Center. Around 40 people with different skills and competences varying from art history and colour-studies to technical and graphic design gathered on a Friday night in Yerevan : 14 ideas were pitched and 6 teams formed to present their prototypes on Sunday. Our product is a digital comic that creates and rethinks culture. We're incorporating elements of the Armenian epic with a futuristic cyberpunk setting, hoping to tell a touching story about the past, the present and the future.This story will be endearing both to Armenian people and to people of any ethnicity and background. Our project will make you feel, see and hear everything the main character will be going through. We have created an entertaining product (mobile game) “RGB Rescue”. That’s our chameleons story. His name is “RGBic”, and he’s trying to not be coughs by evil eagle. The game has simple mechanics. You need to help RGBic to get the environments colour by adding or reducing red, green and blue colors (RGB system). The gaming process has its side effect to teach users the basics of color theory. During the playing process, player automatically gets involved in choosing the right color with mixing 3 main ones and st working with colors. We want to create one unique chatbot system about Armenian history, culture, monuments. And we hope that our chatbot system will contribute to the development of tourism in our country. It will make easier for tourists to discover Armenia and get necessary information in few seconds. We are going to keep connection with our users and send them an attachment to get their feedback on customer service. An app where letters from old Armenian manuscripts are turned into colors and numbers. A story about a new superhero who can move things with light that coming out of his hands. Follow us on Facebook and Instagram and don't forget to follow the LIVE STREAM tomorrow at 6pm GMT+4. to support the teams!